The Stephano Collection brings suspended décor to an outdoor area with a hanging lantern. The Stephano 15" Hanging Lantern brings unobtrusive lighting to any outdoor living area while boasting an eye-catching design. 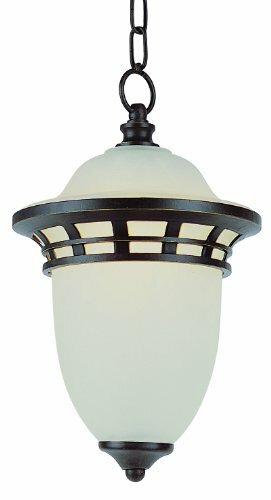 Fully enclosed with Marbleized Glass, this piece provides soft illumination without glare, while also protecting the bulb from wind and rain. Used for both decoration and function, the Stephano Collection is the perfect fit and balance of style, taste, form and function. Bulb Type: Incandescent. For Outdoor use. Has adjustable dimensions. Chain length: 36 inches. This item is ok for vaulted ceilings. Type of glass is White Frosted. The materials used are: Metal, Glass, Electrical. The Finish is Bronze. Bulb base is E26. The bulb is not included. This item is dimmable. The bulb shape is A19. Wet listed. Warranty details: One year limited Warranty. If you have any questions about this product by Bel Air Lighting, contact us by completing and submitting the form below. If you are looking for a specif part number, please include it with your message.